Welcome to Baan Sawan, a three bedroom holiday home set in a prime location in Bophut, North Samui. From your villa, you’ll enjoy uninterrupted vistas over the ocean and lush tropical surroundings. Built to offer a five-star holiday experience, Baan Sawan comes fitted out with amenities like a sparkling infinity pool, beautifully manicured garden, impeccable service and well-appointed interiors. 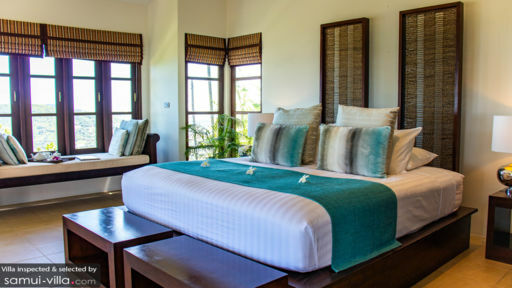 Six guests are comfortably accommodated in three bedrooms, all of which feature plush beds, quality linen, lofty ceilings and air conditioned interiors. The attached en suite is fitted out with twin vanities, a toilet and a bathtub or shower recess. 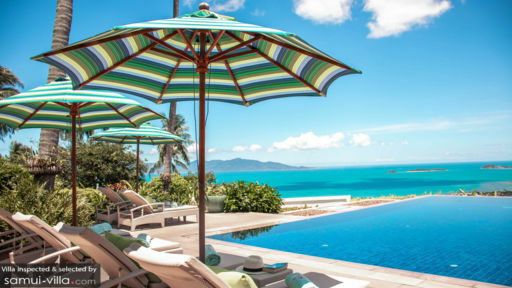 Dipping into the pool takes on a whole new meaning at Baan Sawan - here, you’ll be making a splash in a glimmering infinity pool that overlooks Samui’s coastline. After a swim, lounge back against a recliner while you take in the picturesque tropical landscape that unfolds around the villa. The spacious garden pool deck doubles up as an excellent venue for hosting weddings, corporate events and parties. Each of the living spaces feel airy and inviting, thanks to the lofty ceilings and wide windows that allow ample sunlight to stream in. The main living area houses a lounge and dining area, and extends out to include a capacious veranda with alfresco dining facilities. A fully equipped kitchen - complete with a snazzy Lavazza coffee machine - allows for self-catering. There’s also the option of leaving the cooking to Baan Sawan’s renowned gourmet chef, who has an impressive repertoire of dishes up his sleeve. Baan Sawan is a full-service property. A daily breakfast service and housekeeping services are included with your stay. Amenities available at additional cost include personal chef services, airport transfers, personal driver services, car rental, child minding services and laundry service. Your villa manager will readily assist with arranging your tour bookings and transportation needs, as well as in-villa massages, in-villa yoga sessions, tennis coaching and court rental and football training for kids. 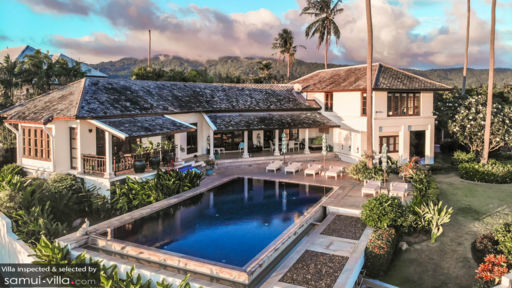 Baan Sawan is located in Bophut, North Samui. The main draws of the town are Bophut Beach and Fisherman’s Village; the former is a golden coast that stretches out in an arc between Mae Nam and Bangrak, while the latter is a charming hub lined with traditional shophouses and modern establishments. There’s myriad restaurants, bars and high-end boutiques, and a family-friendly setting that lends itself to vacationers of all ages. Step out to sample the some of the tastiest plates on the island at restaurants located in the vicinity. We like June’s About Art Cafe for its cosy ambience and healthy organic fare, Café De Pier X Samui for its tapas items and cocktails, Il Salotto for Italian fare accompanied by sweeping sea views and Karma Sutra for its chilled out vibes. You’re an easy drive away from yoga studios, cooking studios, high-end spa venues, cultural sites and more. Island Organics, located about 15 minutes’ drive away is a great place to try your hand at cooking Thai dishes. The Yogarden Samui has a variety of yoga classes to suit practitioners of different styles and levels. Hop into a car for a 15-minute drive to The Sarann Spa to indulge in its massages, facials and milk baths. Plan your day trip itinerary around attractions like the Secret Buddha Garden, Lad Koh Viewpoint, Big Buddha and Wat Plai Laem. These attractions are clustered around the northeast and central regions of the island, and are within an hour’s drive from your villa. Avid scuba divers and freedivers will enjoy an offshore trip to the neighbouring island of Ko Tao, a destination known for its crystal clear waters and abundant marine life and corals. Ferry boats depart from Mae Nam Pier, and the ride lasts about an hour and 45 minutes.